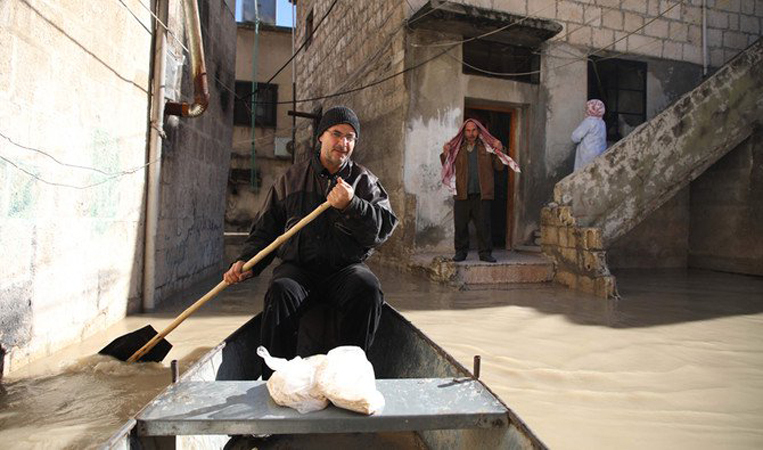 The alleyways of the Syrian town of Darkush are normally thronged with pedestrians but since the swollen Orontes River burst its banks, Abu Ihab’s boat has provided the main way of getting around. The 49-year-old farmer normally takes a well-earned rest in January when winter frosts turn his fields as hard as rock. But this year, days of torrential rain in the mountains of Lebanon has sent a deluge downstream, submerging the streets of his hometown under as much as 5 feet of water. So instead the father of four is working long hours each day paddling his boat around the streets helping stricken residents to get their children to school, do the shopping or check on relatives. “In winter, I don’t usually leave the house much as it is cold and it rains.